A CREATIVE competition to inspire the next generation of recyclers has been enjoyed by Bookwell School pupils. 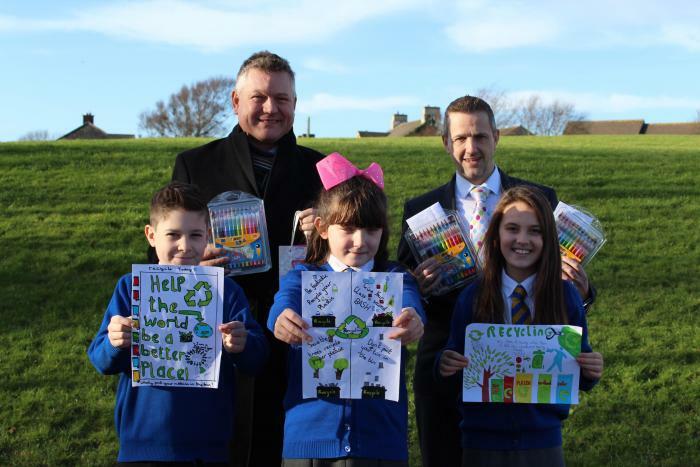 Kaitlyn Fraser, aged ten created the winning design, which will be sent to every household in the area to promote Copeland Council’s new recycling service and encourage residents to recycle more. Russell Hardy, Headteacher at Bookwell in Egremont, said: “They have been so enthusiastic about the new scheme and have made sure all the children in the school are aware of the changes. William Hall, aged nine, was second, and Halle McMullen, aged ten was third. The winner received an annual family pass for The Beacon Museum in Whitehaven, and the second and third-placed pupils received free entry to an upcoming craft session at the museum. All three also received a stationery set. Mike Starkie, Mayor of Copeland, who judged the competition, said: “It was a tough decision with so many fantastic entries to choose from. “I was delighted to see the effort put into the competition with the pupils creating some very colourful designs and catchy slogans, and I’d like to thank the school and each and every pupil that took part. From April, Copeland's expanded team will collect five different materials in three boxes and a weighted bag. Paper, glass, card, plastic and metal will be collected from the kerbside for more than 95 per cent of Copeland's householders. When the scheme starts, there will be four new vehicles (expanded from the previous fleet of three) and an extra crew of three people. The new lorries can collect five different materials and store them separately, ensuring the best value when the materials are sold. Residents will be given three boxes - a green one for glass, a black one for metals and plastic, and a blue one for paper - plus a white weighted bag for card. In the coming weeks, the council will tell residents exactly when their new containers will be delivered. Collection day calendars and leaflets of what can and can’t be collected will also be distributed.